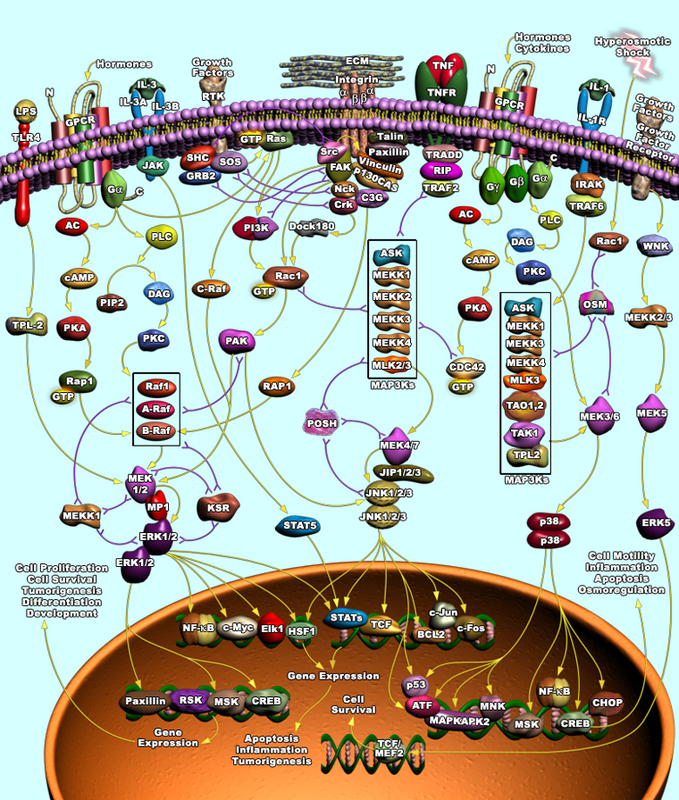 The mitogen-activated protein kinase (MAPK) signaling pathway is activated by a number of extra and intracellular stimuli including cytokines, growth factors, and hormones as well as stressors such as oxidative and ER stress. This pathways plays a key role in the regulation of many cellular processes including proliferation, differentiation, the stress response, motility, growth, differentiation, survival, and death. Abnormal MAPK signaling may contribute to increased or uncontrolled cell proliferation and/or resistance to apoptosis. Dysregulation of controlled MAPK signaling has been shown to be important in the development and progression of many diseases including various types of cancer and neurodegenerative diseases such as Alzheimer's disease (AD), Parkinson's disease (PD), and amyotrophic lateral sclerosis (ALS).